Amaltheia Organic Dairy is a a family owned and operated certified organic Goat Cheese Dairy. Amaltheia Dairy has developed Chevre, Feta, and Ricotta cheeses, as well as a variety of flavored Chevres, such as Roasted Garlic and Chive, Spiced Pepper, and Sun-dried Tomato Chevre. Amaltheia Dairy sells 17 different products and has the capacity to produce 2,000 pounds of goat cheese a week. The herbs used to flavor the cheeses are locally grown and organic whenever possible; the goat cheese product is entirely natural. Amaltheia Dairy uses vegetarian-friendly vegetable rennet only. Amaltheia is a zero-amission dairy farm where all by-products are utilized. They now raise organic whey-fed hogs and organic compost. 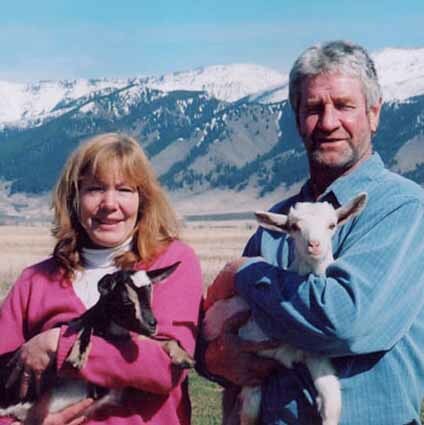 Melvyn and Sue Brown began their Grade A Amaltheia Dairy, on Thanksgiving Day 2000. They started milking with 90 goats. Initially they sold their milk to a distributor making gourmet cheese for California customers. In the spring of 2002 the Browns decided to develop and operate their own cheese facility. Through careful development and stringent standards for purity and flavor, they arrived at an exceptional product that they are now marketing. Today, they are milking about 280 goats and producing 150 gallons of goat milk each day. Making one pound of goat cheese takes 5 pounds of goat milk. It is carefully pasteurized and cultured, and the cheese making process requires a great deal of hands-on attention. The Chevre takes about three days to make, and the other cheeses vary, but all are made in small batches and shipped or delivered promptly. Goat cheese enthusiasts can find Amaltheia products sold locally in Bozeman, MT and health food stores on both coasts and in Wyoming, Montana, Colorado, New Mexico, and Idaho. Amaltheia Dairy LLC can be found in Whole Foods Natural Markets and Trader Joe's Company nationwide. You can even buy directly from Amaltheia Dairy. Stop by the cheese facility to tour through their cheese plant which is located in the town of Belgrade in a small industrial park or call in advance to arrange a tour of the farm.